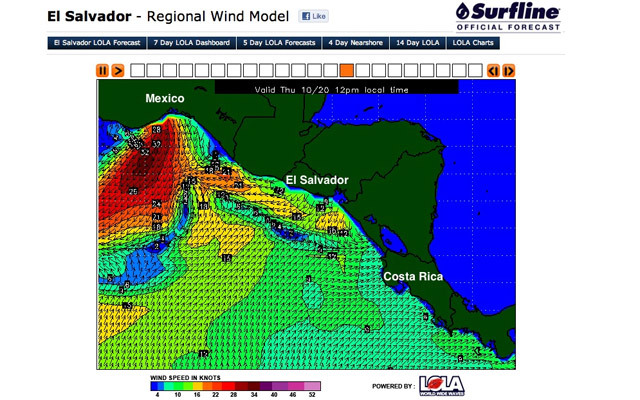 The LOLA image below displays the forecast offshore NE'erly winds for El Salvador by Thursday morning. BRIEF OVERVIEW: Over the next couple days, expect a mix of dominant local SW windswell and minor SSW-SW Southern Hemi groundswell, as well as stormy weather but lighter wind. Then look for an overall easing trend in the surf Thursday through Saturday. However, the waves become more organized and conditions are expected to improve through the second half of the week. 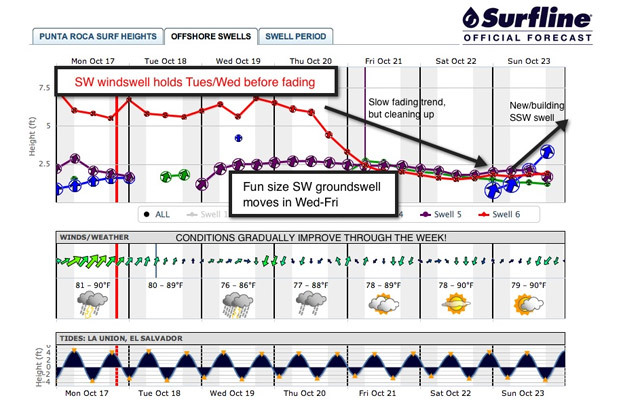 New long period SSW groundswell due to build in over Sunday for the finals and into next week. SWELL/SURF: Mixed-up blend of mostly local SW windswell and minor/easing SSW groundswell. Surf still jumbled, mainly in the chest-head high+ range (4-5’+) with occasional overhead waves/peaks (6’+). WEATHER/WIND: Stormy weather with rain showers/thunderstorms expected. SW’erly wind variable between light to moderate strength throughout the day. SWELL/SURF: Dominant local SW windswell holds as a new/minor SW groundswell fills in. Surf remains jumbled, but trying to clean-up and organize some; mainly in the chest-head high+ range (4-5’+) with occasional overhead waves/peaks (6’+). WEATHER/WIND: Stormy weather with rain showers/thunderstorms expected. Lighter SW veering WSW wind through the morning. *Keep an eye on the wind as it may clock offshore over the afternoon (West-WNW-NW) as the trough passes through the region. SWELL/SURF: Blend of holding SW groundswell and fading SW windswell. Surf is still a little mixed-up, but much more organized than previous days. Waves hang mainly in the waist-head high zone (3-5′) with occasional sets pushing slightly overhead (6′) in the morning. WEATHER/WIND: Light to moderate offshore NNE-NE wind in the morning. Light SSW breeze in the afternoon. Possible evening glassoff. Still a good chance for passing rain showers and thunderstorms, but likely more moments the rain stops. SWELL/SURF: Blend of easing SW groundswell and minor/fading SW windswell. Look for better organized surf mainly in the waist-shoulder high zone (3-4′) with occasional sets up to head high (5′). WEATHER/WIND: Light offshore NNE’erly wind in the morning, with a light+ SSW-SW seabreeze for the afternoon. Possible evening glassoff. Chance for passing rain showers and thunderstorms. Partly to mostly cloudy skies. SWELL/SURF: Mainly an easing SW groundswell mixed with minimal SW windswell leftovers. Look for mostly waist high surf (2-3′) with inconsistent waves still pushing up to chest high (3-4′) during the better tides. Below is an image of the LOLA forecast dashboard for Punta Roca. A broad fetch of fairly strong SW’erly wind extending well offshore from El Salvador will maintain a steady dose of good size shorter period SW windswell through Tues/Wed. Meanwhile on Tues/Wed, we’ll have minor Southern Hemi groundswells mix in; old/fading SSW (205-185 deg) and new/building SW (225-205 deg). As we move through Thurs/Fri, the local SW windswell will drop and the new SW groundswell (peaking on Thursday) will gradually take over to become the primary swell. Further out; we’re currently watching the progress of a new and strong storm development over the SE Pacific, which will deliver a fairly solid and broad angled SSW groundswell (210-190 deg) to El Salvador for next week. The initial long period forerunners of this swell will steadily build in Sunday the 23rd into Monday the 24th, peaking around mid-day on Monday and holding steady into Tuesday the 25th. On Sunday, we’ll see a gradual build through the day; from knee-waist occasional chest high in the morning, to chest-head high+ before dark. On Mon/Tues next week, we’re expecting plenty of overhead waves to show with occasional sets up to double overhead or so. This swell would then ease very slowly through Wednesday the 26th and the rest of next week. WEATHER CONDITIONS: Stormy weather is expected to continue through at least the next 2-3 days with scattered rain showers and thunderstorms. Then we may see the weather improve a little for the last few days of the event waiting period, but passing rain showers and thunderstorms are still very possible. WIND CONDITIONS: The onshore SW’erly wind prevailing for Punta Roca recently is expected to ease through Tues/Wed, possibly even clocking West-NW over Wednesday afternoon into the night. By Thursday and moving through the last few days of the event, we’re looking for light+ NNE-NE morning wind and much cleaner conditions at Punta Roca, followed by a light SSW seabreeze each afternoon with possibly evening glassoffs.